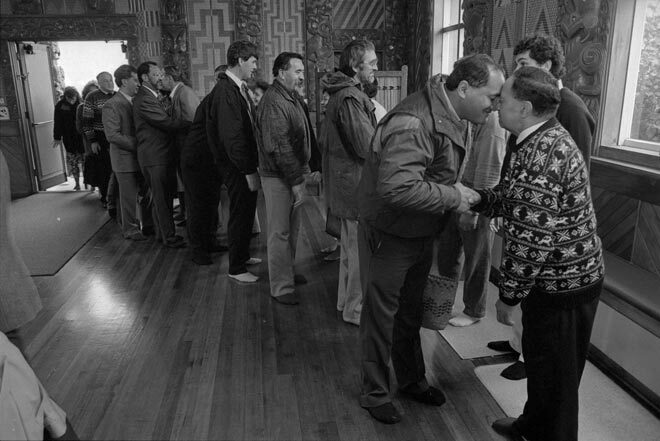 Manuhiri (guests) are welcomed by the local Te Āti Awa people at Waiwhetū marae in the Hutt Valley. Te Āti Awa have a slight variation to the usual protocol – they hongi (press noses in greeting) and harirū (shake hands) before the speeches begin, rather than after, as is more usual. Otherwise they follow pāeke kawa (protocol) at their pōwhiri (welcome ceremonies), which means the tangata whenua (host) speakers all speak first and are followed by all manuhiri speakers.